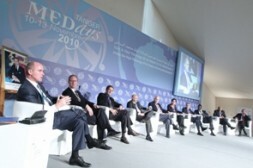 Speaking at the MedDay2010 Conference of the Institut Amadeus in Tangier (Morroco), Dr. Hubertus Hoffmann (left), President of the World Security Network Foundation demanded:"The containment and combating of extremism and criminals motivated by Islam should be focused on the ideological, Islamic level. Whoever claims to kill in the name of Islam, yet does not have actual justification from Islam, places himself outside of the Islamic community (Umma), isolates himself, degrades Islam, and sins against the conscience of the Prophet (pbuh) himself. He is offending both the Prophet (pbuh) and Allah. He makes himself guilty according to the Sharia and must therefore be punished in accordance with Islamic law"
Most Muslim and Western countries continue to be engaged in conflicts against 'Islamist' militant movements, including Al Qaeda, both inside and outside their own borders. This will continue over the next decade. These militants are a threat first to other Muslims, and second to the open societies of the West. The ‘hard' factors of security are required and important, but are not enough to win. To win, we urgently need a smart new double strategy of hard and soft factors, of de-radicalisation and peace-making. The majority of Muslim society has unfortunately remained passive, leaving the radicals too much room to manoeuvre as the German democrats did in the 1920s and 1930s when faced with the threat of Nazi hate propaganda. First, a roll-back-policy de-radicalizing, demobilizing and reintegrating individuals and groups that were engaged in insurgency and terrorism. Second, a clever containment policy to stop the recruitment of young Muslims to kill their fellow Muslims and people in the West 'in the name of Allah'. It must be made very clear that Islam does not allow civilians to be killed in the name of the Koran. The soft factors of peacemaking are often put aside by harder military instruments of peacemaking. The focus on homeland security and promoting stability through military means has led to an unbalanced approach. The human soul, the needs of the victims of oppression, their suffering and their dignity lie at the heart of peacemaking, but have almost been forgotten. A cold power policy has prevailed that will not be able to produce stability and perpetual peace. We need a global jihad for tolerance and respect like the Prophet himself (pbuh) demanded. The containment and combating of extremism and criminals motivated by Islam should be focused on the ideological, Islamic level. We need a global vision and soul. We need globally respected moral values. Their steady promotion is just as important. We should promote Human Codes of Tolerance and Respect in all countries of the globe to counter the hate propaganda of the radicals (see www.codesoftolerance.com for details). Several national governments like Afghanistan, Iraq, Yemen, Saudi Arabia or Somalia will be faced with the critical task of demobilizing and reintegrating former terrorists and insurgents. More than a dozen countries, including Singapore, Saudi Arabia, and Libya, have successfully established de-radicalization and disengagement programs, which aim to facilitate enemy combatants' reintegration into society and ensure they will not return to violent jihad. An important element of this is convincing former radicals about the true teachings of Islam. Terrorist criminals and hate preachers around the world justify their deeds with commandments from Islam, the Qur'an, and the example of the Prophet (pbuh), the Hadith. In their view, these acts are not only justified; they are their duty as Muslims and thus not evil but good. This one-sided interpretation of Islam is the motivation, soul, and power of their crimes and must be the focus of any containment and roll-back policy. The containment and combating of extremism and criminals motivated by Islam should therefore be focused on the ideological, Islamic level. If it can be successfully proven that neither the Qur'an nor the Hadith justify acts of terror, then one can deny terrorism founded on the wrong perception of Islam the oxygen it needs to survive, limiting its attractiveness to followers and un-masking the perpetrators as pure criminals. Whoever claims to kill in the name of Islam, yet does not have actual justification from Islam, places himself outside of the Islamic community (Umma), isolates himself, degrades Islam, and sins against the conscience of the Prophet (pbuh) himself. He is offending both the Prophet (pbuh) and Allah. He makes himself guilty according to the Sharia and must therefore be punished in accordance with Islamic law. The Higher Ifta' Council, established by the organization of the Islamic Conferences with representative councilors from the Muslim World who issue fatwas on all the pertinent issues that arise, should be designated the main ‘clearing committee' by more Muslim and as well Western countries in important cases of terrorists. The aim would be to benchmark their deeds against true Islam. The King of Saudi Arabia should establish - at the request of the Saudi Minister of the Interior - a new council of Islamic legal experts to whom foreign courts, public prosecutors, and government departments can turn to receive expert opinions for the judgment of crimes justified by Islam ("Royal Sharia Council of the Custodian of the Holy Mosques of Mecca and Medina"). After being invoked, the council decides quickly about the Islamic legal questions presented to it and delivers an expert opinion. Because many terrorist crimes are similar, the council can deal with many cases at once. The committee should include Imams from the two most holy sites of Islam, so that these expert opinions carry particular weight. According to Islamic law, the killing of civilians in Jihad is principally forbidden. Terrorist acts and the preaching of violence are a violation of the Qur'an and the Hadith. The expert opinions of this council should cut off the ideological oxygen to both preachers of violence and terrorist criminals. Furthermore, they would serve as an important instrument to prevent further recruitment of terrorists. As prime examples, top Al Qaeda leaders like Osama bin Laden or Anwar al-Awlaki should be examined by the new council and punished according to Sharia law with more to follow. The Muslim world must un-mask these criminals from their Robin Hood-image in the bazaars and homes of ordinary people, and by this stop terrorists recruiting in the name of Allah as well. These expert opinions can be drawn on in ongoing criminal trials in Muslim and Western countries for the evaluation of possible means of justification and the degree of personal guilt. With this measure, Sharia is not implemented in any Western country yet the particular characteristics of guilt by terrorists are underscored. These expert opinions should make court judgments in the U.S., the UK, Spain or Germany more effective and considerably increase the deterrent effect of the penalties. As most terrorists neglect the authority of Western laws the verdicts of punishment must be based on Sharia law as well on both levels of justice. This way the Muslim world can cleanse itself from the sinners of hate and murder and continue to follow the true aims of the Prophet and the Koran.